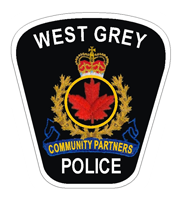 Between March 13th and 20th, the West Grey Police Service responded to 75 calls for service. The West Grey Police Administration Office will be closed Thursday March 22, 2018 and Friday March 23, 2018, re-opening at 08:30a.m on Monday March 26, 2018. We apologize for any inconvenience. If you have an emergency call 911. If you require police call 519-371-6911 and speak to one of our dispatchers. For any administrative assistance please call 519-369-3046 and your call will be answered on March 26, 2018. Sometime during the evening of the 17th to 18th of March 2018 an unknown person(s) stole the stop sign for Southbound Concession 2 and Southgate-Glenelg Town Line in West Grey. The person(s) pushed the sign over using a motor vehicle bending the sign low enough to remove it. Crimes like this cause a hazard to public safety and Police are requesting the public’s assistance in identifying the thief. Anyone with information is being asked to call Police at 519-371-6911 or call Crime Stoppers at 1-800-222-8477.
released on conditions by way of Recognizance and was issued a court date where he will answer to the charges at the Walkerton Courthouse. Between the 14th and 17th day of March, a break and enter occurred on Albert Street in Ayton. The suspect(s) entered the dwellings garage and stole a tackle bag along with various fishing lures, a Debbie Travis vanity light which was brown in colour with frosted glass, and a Camouflage FRX motocross helmet which had a broken mouth piece. Suspects also stole a 946ML bottle of Amsoil ATV oil, a red Garrison Kitchen small fire extinguisher and a green deer camera with a memory card. The total value of the stolen items is $695. This investigation is ongoing and the public is asked to contact West Grey Police 519-371-6911 or call Crime Stoppers at 1-800-222-8477 with any information.